The MO-200 is designed to measure 5 – 100% oxygen while the handheld meter displays and stores measurements. 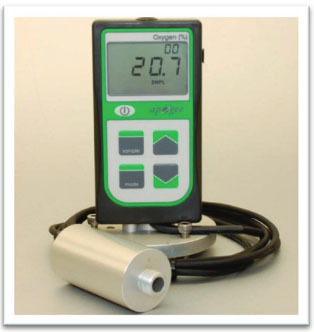 The wide measurement range allows it to be used for applications either in the soil or in the lab with the available diffusion or flow-through heads. The sensor is calibrated to ambient air making it very easy to calibrate. An aluminum housing that is filled with epoxy allows the sensor to withstand harsh conditions.